The Ergoline lounge stand up machine has 180W high performance, 2 metre long lamps which transform the lounge into a power tower. It provides an integrated cabin equipped with every feature to make getting changed a comfortable experience and superior body cooling is adjustable from the interior control panel. 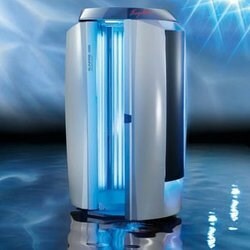 It has a maximum tanning time of 9 minutes and is ideal for those who tan quickly.